Croatia's external debt has been growing steadily since the exchange rate stabilization in 1994. It reached almost 85% of GDP at the end of 2003. The level and the trend raise questions of sustainability and thus of an appropriate policy response. The current trend of debt accumulation is not sustainable. In the past five years, the debt to GDP and to exports of goods and services ratios have been growing by 8 percentage points on average. The horizon of sustainability, however, is not easy to determine. If high growth rates could be sustained and there are no adverse external shocks, stability could be extended over the medium term but probably not longer. 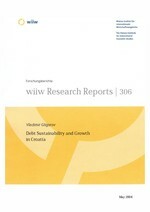 The main policy challenge stems from the nature of the external debt problem that Croatia faces. It is more supply- than demand-driven: low exports and high imports point to an exchange rate misalignment. If that is the case, then monetary and fiscal policies that restrict demand tend to trade growth for debt in the short run, i.e., slower growth of debt is achieved with lower growth rates. The supply side problem, however, needs to be addressed through measures that increase competitiveness. In the absence of exchange rate flexibility, incomes policy is the alternative. Its feasibility and effects should be studied carefully.